Dog lovers in Chichester District are backing a new project aimed at ensuring owners can walk their animals while also protecting Chichester Harbour's internationally important migrating birds. The project is being led by Chichester District Council with support from Chichester Harbour Conservancy and the National Trust. The idea is to create a network of exciting dog activity areas outside the harbour, providing fun and fitness for owners and their dog. Features could include, dog tunnels, weaves, jumps, balance equipment and hopefully dog ponds that can be used all year round, especially in winter, which will hopefully reduce the disturbance to our visiting winter wading birds. Members of the public are being asked for their ideas as part of a public consultation which ends on Friday 31 March. 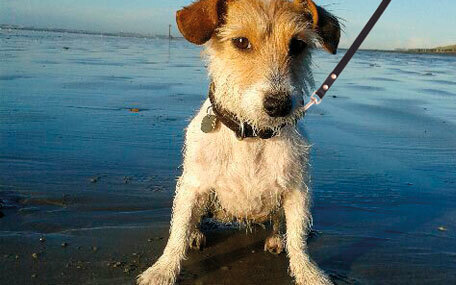 Councillor John Connor, Cabinet Member for Environment Services at Chichester District Council, says: "We know that people love their dogs and want to walk them along Chichester Harbour. However, research indicates that during the winter period, when dogs are off the lead and enjoying themselves, they can unintentionally disturb the winter migrating birds that feed on the ground in the harbour. These birds are internationally protected, and need to build up enough energy to fly back to their summer breeding grounds. "When a dog comes along, the birds will naturally fear a predator and either stop feeding or fly away to escape. Unfortunately these disturbances harm the birds because they use all their energy flying away when they need to be on the ground feeding and conserving energy - it can take a bird a whole day to refuel the energy lost. "The result is that they are not gaining enough weight to survive the summer migration. The combination of the short daylight hours in winter plus the fact that many of these birds feed at low tide mean that feeding time is limited, so it is vital that disturbances are kept to a minimum. Unfortunately the cumulative impact has a serious effect." Chichester District Council wants to enthuse dog walkers about the importance of the harbour and how everyone can make a difference by ensuring dogs are kept close to their owners. A special card highlighting the important role dog walkers can play has been produced and will be distributed at key points in the harbour. A number of ideas are currently being considered for the network of stimulating dog activities. Richard Austin, AONB Manager for Chichester Harbour Conservancy, says: "We believe that everyone can enjoy the harbour while also helping protect these important birds - which are what make it such a special and world-important site. "We want to work with dog owners and educate people about being considerate and keeping animals under control. We believe dogs, humans and birds can all co-exist, and we hope that by creating some special areas close to the harbour which are attractive to both dogs and their owners, we can achieve this balance. We look forward to meeting dog owners at the various events we will be attending over the summer and hearing their ideas." Chichester District Council is a member of the Bird Aware Solent, a partnership of coastal local councils and conservation bodies from Selsey to the New Forest. The aim is to help people enjoy the coast without disturbing the thousands of birds that over winter there.